Amy Poehler in Parks and Recreation © NBCUniversal, Inc. 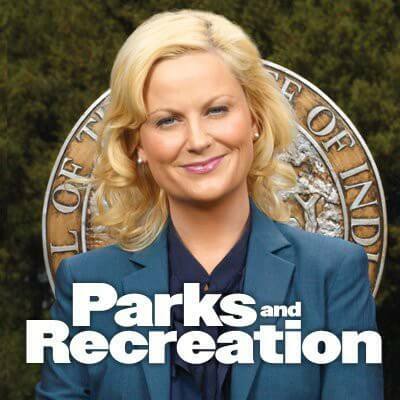 The Synopsis: Parks and Recreation follows Leslie Knope (Emmy Nominee Amy Poehler) a mid-level bureaucrat in the Parks and Recreation Department of Pawnee, Indiana, and her tireless efforts to make her quintessentially American town just a little bit more fun. Leslie’s office mate is Tom Haverford (Aziz Ansari), a fashion-obsessed wannabe player whose greatest dream is to own his own nightclub. Leslie’s boss, Ron Swanson (Nick Offerman), hates the very government he works for, and sports one of the most impressive mustaches on primetime television. Rounding out the cast are Leslie’s best friend Ann (Rashida Jones), her ex-boyfriend Andy (Chris Pratt), and Ron’s assistant, April (Aubrey Plaza).